Roberto A. Chica, Ph. D.
Dr. Chica was born in San Salvador, El Salvador. When he was one year old, he moved with his family to Montréal, Canada, where he was raised. He received a B. Sc. degree in Biochemistry from the Université de Montréal. It was at this time that he became fascinated by proteins, in particular by the relationships that exist between protein structure and function. To learn more about this topic, Dr. Chica completed a Ph. D. degree in Chemistry at the Université de Montréal where he worked on enzyme engineering under the supervision of Dr. Joelle Pelletier and Dr. Jeffrey Keillor. He then undertook a postdoctoral fellowship in computational protein design working under Dr. Stephen L. Mayo at the California Institute of Technology. 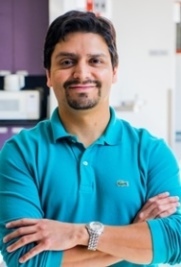 Dr. Chica joined the Department of Chemistry at the University of Ottawa in 2010 and was promoted to Associate Professor in 2016. Research project: Generation of longer emission wavelength red fluorescent proteins using computationally designed libraries. Research project: Substrate specificity engineering of TG2 transglutaminase.